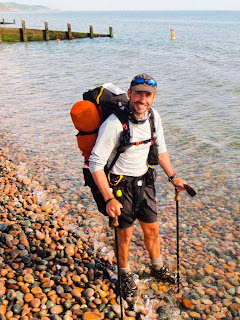 On the 27th of June 2009 at 5.25 pm, a successful completion of the walk, made in the style described above, was made taking 12 days and 9 hours, walking East to West. Outlined in the following page is a detailed report on the planning involved and lessons learnt during the undertaking.
" Plan your own marathon and do something never done before, something you will enjoy, a route that will take you to the places often read about but never yet seen, you will be on your own, unhampered by human beings en bloc, relying on your own resources to complete what you set out to do. Preferably go alone and do it off your own bat, for it is the solitary walker, always, who most closely identifies himself with his surroundings, who observes as he goes along, who really feels the satisfaction of achievement "
Be under no illusion that this walk is waymarked throughout. It is an unofficial route and as such suffers from a scarcity of signage that, depending on your outlook, will lead to a more or less enjoyable experience. However your preferences, you will be led on a quiz chase of contrived progress that for me added to the character of the trail and endeared me to its individuality. Ideally take a guide book, maps, compass and Gps and know how to use them, as crossing some of the remoter sections in bad weather could be interesting. There is a wealth of helpful information on the Web about this walk so don't be disheartened, knowledge is security and weighs nothing so pack as much as you can! I chose the East to West option, Robin Hood's Bay to St. Bee's. Walking this direction, chosen as the bulk of the food weight would be consumed by the time the Lakes was reached, proved to be a fortuitous decision. Contrary to the opinion that its better to have the weather at your back, the Westerly wind initially cooled and prevented excess sweating, consequently saving water. Luckily, during the Lakeland section, switching to an Easterly, gave much needed assistance up them hills! Having the Lakes, as the last third was indeed the "Jewel in the Crown" and I would favour this direction every time. The only downside seams to be that St. Bee's has not the historical finishing significance or character of Robin Hood's Bay. Wainwright's route was followed for the whole distance, taking the direct route between Rosthwaite and Patterdale and the High stile alternative between Rosthwaite and Ennerdale Bridge. I aimed to walk 16 miles a day but this varied in reality to between 14 -19 miles. See Navigation post for more info. This is based on a no pan, no washup system and was conceived to require the least amount of water and effort possible. 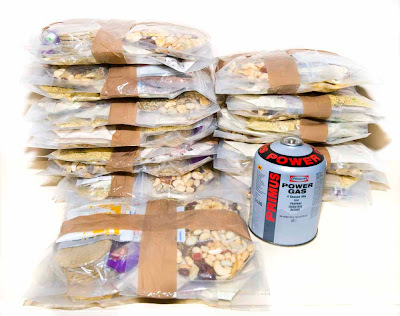 Food is stored and hydrated, via cold or hot water from the Stove System and eaten in the same resealable bag (1-5). 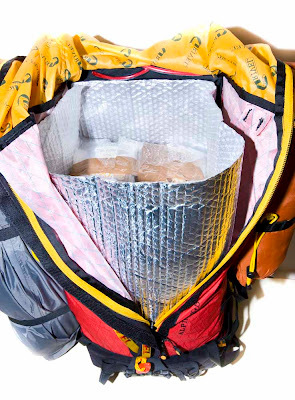 Hot water hydrated food is placed inside a thermal jacket (9) to preserve heat and aid in the cooking process, this also conveniently acts as a hand friendly heat barrier during eating. For more info on this cooking system see The Alpine Oven blog. This equates to just under 4000 calories for a packeted weight of 1kg per day. Total weight of food to be carried for twelve days equals 12kg. Drinking vessels (7) are cut down Pot Noodle pots 17g and hold 300ml, for tea and coffee. 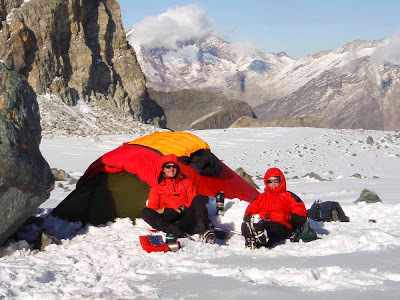 A Spork (8) 10g completes the system which has been proven on a 3 night acclimatization camp above 3000m, on the Allalinhorn glacier above Saas Fee in Switzerland. 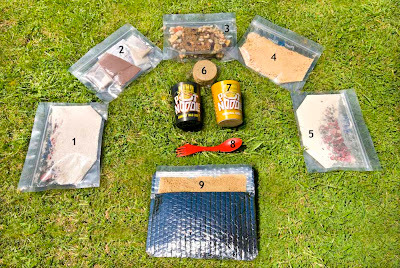 Pictured below are the meals packaged into 12 daily packs, (gas canister for scale) and view inside of rucksack, protected from heat by metallic bubble wrap. Not much space left! The pre-prepared fast, no fuss meal preparation really paid dividends at the end of a long hard day. Water is purified in one of four ways in this system. The first by boiling on the stove, the second (8) by Katadyn tablets 7g, the third (9) by Premac's Travel Well Pocket pump 47g and the fourth (3) by my own designed gravity filter 48g (wet). Water requirement for hot food and drinks works out at 2 litres a day, this will be drawn at camp or taken from a supply shortly before and is purified by heat. If time and weather allow, this water can be preheated in a pop bottle (7), half covered in sticky back plastic to aid solar absorbtion and therefore save on gas. 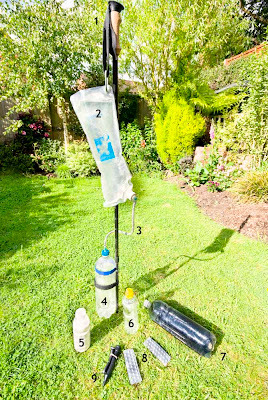 Katadyn tablets will be used to treat cold water stored in a 2 litre Platypus bag (2), which then has the option of being filtered through my own gravity fed widget which is basically a short piece of hose filled with Brita water filter granules, obtained from a spare cartridge. Its a slow process but left over night it will fill a 2 litre container (4) hung from a walking pole (1). Hopefully this will reduce heavy metals and eliminate any bad tasting water but this is as yet untried and I'll report on it's effectiveness later. Another option to top up on the go is the Travel Well pump, kept handy I can fill a small container (6) as and when water is available on the trail. Lastly, Isotonic drinks powder (5) 395g is added to any drinking water as an alternative taste and also offer a quick energy boost. The envisioned way this will work is that I shall be carrying 2 litres for that days consumption. As I drink this, any chance to top up with the mini pump will be taken, still carrying no more than 2 litres. Nearing the days projected end, it will be seen on the map whether the desired stopping point might have a water source. If it does I carry on and have no problem. If it does not then at a preceding source, I shall top up my 2 litre day container, plus fill another 2 litre for my cooking allowance. I then walk hopefully only a couple of miles with 4 litres. The day 2 litre then will filter overnight ready for the next day and so on. Last minute changes have led to the 2 litre bottle (4) being replaced by a 2 litre Platypus. With all the air removed this becomes a sealed system preventing possible spills and contamination. The main lesson I have learned is that the value and importance of water cannot be under estimated. I did exactly this and paid the price by being dehydrated. Sourcing water in upland areas was least problematic but lowland farm land and populated areas had the possibility of high levels of Nitrates and microbiological content and seemed too risky. I walked long distances with limited water during these times and developed a steady walking rhythm, breathing in and out through my nose, which greatly reduced usage by limiting evaporation surface area and recycling exhaled vapour. keeping cool and therefore limiting sweating was helped by thin cloud cover and windy days during the first week. As the weather warmed, water availability increased also allowing more uptake. Problems occurred in limestone areas where water containing carbonic acid reacts with limestone and becomes hard. Calcium and magnesium bicarbonates are formed. I did suffer from trapped wind in these areas which made me feel slightly sick and off my food. The chemistry of the body is not my forte but their was definitely a PH imbalance going on here. Heavy metal's including lead were a danger after leaving Richmond so I carried a surplus through this danger area. All of the water I drank was treated in the ways outlined above, no untreated water was consumed and no upset stomach experienced. In hindsight I would have taken a more capable hand pump filter to allow for more reliable sourceing. The plastic pop bottle was invaluable as it allowed filling from streams, which was not possible with the Platypus reservoirs. I did not find time to use it as a solar heater, however it did produce warm water on the odd occasion it was left full on my sack. What do you know! Platypus got there first. A semi religeous experience, I cried, transfixed by the amount of fresh cool clean water at this beautiful spot, I literally couldn't believe it. The "SILVERPOINT Solar Trio" Solar Charged LED Torch (1) will be used as my light source, saving weight on carrying a separate torch. It will be positioned on top of my sack and will charge its own 7oomAh/4.8v internal battery in daylight hours. It's power, via lead (6), can be used with adapter (4) to charge my phone (3) which is also my MP3/radio. It can run my GPS (2) direct via USB connection or charge spare AA batteries (5) for its use. Whilst never an ideal energy source ( power to weight ratio ) compared with taking quantities of high capacity batteries, I am persevering with the "alternative technology" tack as it potentially offers the benefits of longer periods of autonomy. This will inevitable lead to investing in lightweight thin Powerfilm technology. 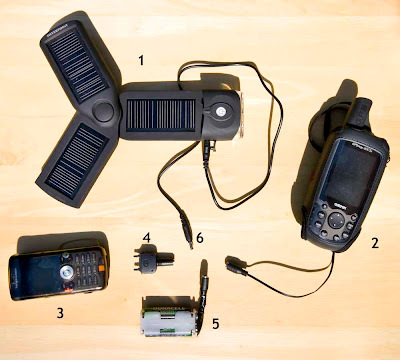 Shortly before leaving I adapted the Solar charger into a higher capacity more adaptable unit. The casing was taken apart and the batteries substituted for four removable high capacity AA rechargeable. The bare unit was then placed in a small water proof pouch. The benefits being the obvious higher capacity storage, the charged batteries could be used in my GPS and it was possible to make sure the unit was fully charged before leaving by using a mains charger. The whole thing weighed no more than the cased original , achieving a better power to weight ratio. The total number of batteries taken were 6 AA's. There was always going to be a shortage of power using this system but I admit I did not perceive to run out so drastically towards the end. The GPS batteries lasted till about day 6 where they had to be rotated regularly as they were not charging thoroughly. Charging my phone took it's toll on the batteries and during the last 3 days my phone was dead and the GPS would stay on for about 2 minutes, before cutting out, every battery rotation. As I lost my map on day 10, navigation proved problematic and it's a miracle I made forward progress but I love a challenge and this made it thrilling to the very finish! A better more reliable power system is needed for any future outing. The tent (5) is a Robens Summer Wind 1.4kg, which is single skin and and the lightest I own, so lets hope for good weather! It has been packaged it in such a way that pitching and striking will take the minimum of effort. 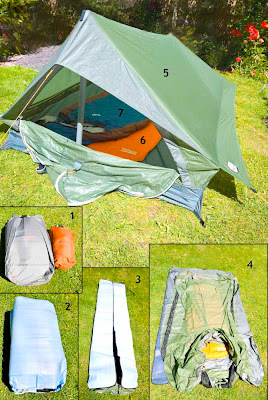 The tent, groundsheet and Thermorest Prolite mat (6) 460g are folded together and bundled into a grey Exped dry bag (photo 1). Unpacking takes place in photo's 2, 3 and 4 and erection, using two walking poles (not shown) and pegs, completes the shelter. The intention is to strap this to the outside of my rucksack as most of the space is taken up by food. 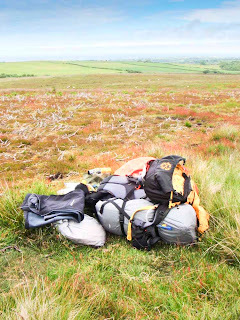 The sleeping bag (7), which is a down Alpkit Skyhigh 400 (no longer made) weighs 1.06Kg including orange Exped dry bag (photo 1). Totalling 2.866kg, this is not the lightest combination but for now it will have to do. The experience with the tent was very positive. Quick and easy pitching at the end of a late day, being tired, hungry and besieged by midges, was a blessing. Single skin tents usually suffer with condensation and this was no exception, despite the high amount of ventilation. This led to packing away and erecting a wet tent which added to the overall weight carried and was unpleasant to enter. Having said that, the wet interior allowed for the effortless killing of midges which easily stuck to the wet side walls. The sleeping bag gave mixed results, during the first half, I was slightly cold at night at higher altitudes, during the second and warmer half, it was adequate. I neglected to take a silk liner bag, due to the extra weight but this would have solved the problem and also kept the bags interior cleaner. The stove system I have settled on is based on a cut down Jetboil pot ( 106 g inc. windshield ) and a MSR Pocket Rocket ( 89 g inc. striker ) , total weight including Primus 450 gas canister is 863 g.
The Jetboil pot is sawn off just above the max fill mark, safely holds 425ml and weighs 106 g with the bottom guard cut off. The wind shield is made from an aluminium can and slips behind the neoprene cover when not in use. 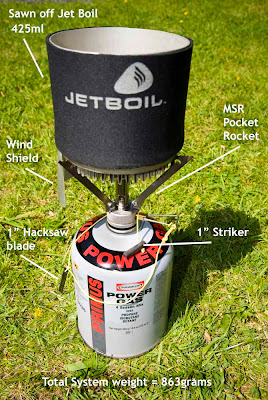 The stoves pot rests locate into the veins on the underside of the Jetboil pot resulting in a secure coupling. Ignition is by striker and steel ( 3g ) which are cut down to one Inch, the latter being a junior hacksaw blade, both are connected to the stove via accessory cord. Trials with this system have resulted in consistant boils of 425ml of water with the usage of 5 g of gas. Using a 450 gas canister should give me 90 boils or just over 7 boils a day based on 12 days, this being more than enough for my needs. The success of the stove system is born out by the fact that only 314g of gas was used, leaving 136g or 30% remaining. This works out, at the used average of 5 boils per day, as an extra 5 days supply being available. The only addition in future being a large tube of relective bubble wrap, as an outdoor wind shield. Choice of foot ware, played a major part in fatigue. Trail running shoes, all very well for an ultralight approach, were inadequate when burdened with a 28kg pack. Every stone underfoot painfully felt, prevented comfortable sleep. Feeling like they had been beaten with sticks at the end of the day became a dreaded curse. 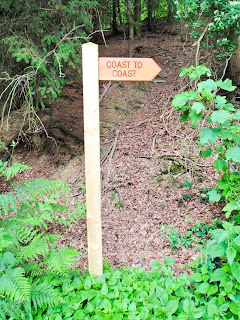 The majority of navigation, made by following a downloaded GPS track, was planned to cut out time wasted in way finding. This approach, while not recommended, allowed all energy to be channelled into forward progress as any mistakes, however small, were keenly felt. Maps were used as a backup and to aid day, route and water planning logistics, no guide book was taken due to weight saving. The downside being that no historical, cultural or factual information could be added to the experience, although this was a calculated compromise from the offset. My Gps, a Garmin Gpsmap 60CSx was loaded with waypoints, obtained from the Web, which allowed me to accurately follow and correct any errors in my orientation along the way. Two Footprint Coast to coast strip maps, East and West, were used and found to be very good on the whole, although a frustrating lack of detail in certain areas was experienced. I downloaded a copy of the strip maps onto my phone as a backup but on losing my map days before the finish, I also ran out of power, so this redundant backup was of no use to me but maybe to a future "unplugger".